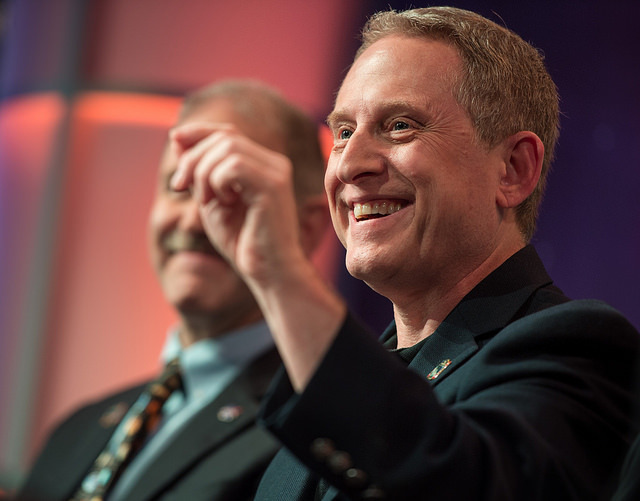 Dr. Alan Stern is a planetary scientist, space program executive, aerospace consultant, and author. He leads NASA’s $880M New Horizons mission that successfully explored the Pluto system and is now exploring the Kuiper Belt—the farthest exploration in the history of humankind. In both 2007 and 2016, he was named to the Time 100 list. In 2007 and 2008, Dr. Stern served as NASA’s chief of all space and Earth science programs, directing a $4.4B organization with 93 separate flight missions and a program of over 3,000 research grants. During his NASA tenure, a record 10 major new flight projects were started and deep reforms of NASA’s scientific research and the education and public outreach programs were put in place. His tenure was notable for an emphasis on cost control in NASA flight missions that resulted in a 63% decrease in cost overruns. Since 2008, Dr. Stern has had his own aerospace consulting practice. His current and former consulting clients include Jeff Bezos’s Blue Origin, Richard Branson’s Virgin Galactic, Naveen Jain’s Moon Express Google Lunar X-Prize team, Ball Aerospace, Paragon Space Development Corporation, the NASTAR Center, Embry Riddle Aeronautical University, and the Johns Hopkins University. Since 2009, he has been an Associate Vice President and Special Assistant to the President at the Southwest Research Institute. Additionally, from 2008-2012 he served on the board of directors of the Challenger Center for Space Science Education, and as the Chief Scientist and Mission Architect for Moon Express from 2010-2013. From 2011-2013 he served as the Director of the Florida Space Institute. Dr. Stern is a founder and serves as the Chief Science Officer of World View, a near-space ballooning company. In 2016 and again in 2017 he was elected to be the Board Chairman of the Commercial Spaceflight Federation. Dr. Stern is also the CEO of a small corporation—The Golden Spike Company. His career has taken him to numerous astronomical observatories, to the South Pole, and to the upper atmosphere aboard various high performance NASA aircraft including F/A-18 Hornets, F-104 Starfighters, KC-135 Zero-G, and WB-57 Canberras. He has been involved as a researcher in 29 suborbital, orbital, and planetary space missions, including 14 for which he was a principle investigator; and he has led the development of 8 scientific instruments for NASA space missions. In 1995, he was selected as a Space Shuttle Mission Specialist finalist, and in 1996 he was a candidate Space Shuttle Payload Specialist. In 2010, he became a suborbital payload specialist trainee, and is expected to fly several suborbital space missions aboard Virgin Galactic vehicles in 2019-2020. Before receiving his doctorate from the University of Colorado in 1989, Dr. Stern completed twin masters degrees in aerospace engineering and atmospheric sciences (1980 and 1981), and then spent six years as an aerospace systems engineer, concentrating on spacecraft and payload systems at the NASA Johnson Space Center, Martin Marietta Aerospace, and the Laboratory for Atmospheric and Space Physics at the University of Colorado. His two undergraduate degrees are in physics and astronomy from the University of Texas (1978 and 1980). Dr. Stern has published over 290 technical papers and 40 popular articles. He has given over 400 technical talks and over 200 popular lectures and speeches about astronomy and the space program. He has written two books, The U.S. Space Program After Challenger (FranklinWatts, 1987), and Pluto and Charon: Ice Worlds on the Ragged Edge of the Solar System (Wiley 1997, 2005). Additionally, he has served as editor on three technical volumes, and three collections of scientific popularizations: Our Worlds (Cambridge, 1998), Our Universe (Cambridge, 2000), and Worlds Beyond (Cambridge, 2003). In May of 2018 his new book with coauthor David Grinspoon, Chasing New Horizons (Picador Press), was published. Dr. Stern has over 30 years of experience in space instrument development, with a strong concentration in ultraviolet technologies. He has been a Principal Investigator (PI) in NASA’s UV sounding rocket program, and was the project scientist on a Shuttle-deployable SPARTAN astronomical satellite. He was the PI of the advanced, miniaturized HIPPS Pluto breadboard camera/IR spectrometer/UV spectrometer payload. Dr. Stern is also the PI of the Alice UV Spectrometer for the ESA/NASA Rosetta comet orbiter, launched in 2004, and served as the PI of the LAMP instrument on NASA’s Lunar Reconnaissance Orbiter (LRO) mission, which launched in 2009. He has served as a Co-Investigator on numerous NASA and ESA planetary missions. Dr. Stern’s academic research has focused on studies of our solar system’s Kuiper Belt and Oort Cloud, comets, the satellites of the outer planets, the Pluto system, and the search for evidence of solar systems around other stars. He has also worked on spacecraft rendezvous theory, terrestrial polar mesospheric clouds, galactic astrophysics, and studies of tenuous satellite atmospheres, including the atmosphere of the moon. Dr. Stern is a fellow of the AAAS, the Royal Astronomical Society, The Explorer’s Club, and is a member of the AAS, IAF, and the AGU; he was elected incoming chair of the Division of Planetary Sciences in 2006. He was awarded the 2006 Von Braun Aerospace Achievement Award of the National Space Society, the 2007 University of Colorado George Norlin Distinguished Alumnus Award, the 2009 St. Mark’s Preparatory School Distinguished Alumnus Award, Smithsonian Magazine’s 2015 American Ingenuity Award, the 2016 Sagan Memorial Award of the American Astronautical Society, the 2016 Cosmos Award of The Planetary Society, the 2016 NASA Distinguished Public Service Medal, its highest civilian award, and the 2017 Distinguished Alumnus Award of the College of Natural Sciences of the University of Texas. Dr. Stern’s personal interests include running, hiking, camping, and writing. He is an instrument-rated commercial pilot and flight instructor, with both powered and sailplane ratings. He and his wife Carole have two daughters and a son; they make their home near Boulder, Colorado.